The Ted Lindsay Award is presented annually to the “Most Outstanding Player” in the NHL as voted by fellow members of the NHLPA. It remains the only award voted on by the players themselves, carrying on the tradition established by the Lester B. Pearson Award dating back to the 1970-71 season. The Ted Lindsay Award recipient is chosen by his peers as the “most outstanding player” for the regular season, representing the highest level of respect and the ultimate peer review. The Award honours Ted Lindsay, an All-Star forward known for his skill, tenacity, leadership, and for his role in establishing the original Players' Association. The Ted Lindsay Award is named in honour of former Detroit Red Wings great Ted Lindsay, a member of the Hall of Fame and four-time Stanley Cup champion. Lindsay’s competitive nature, focus on players’ rights, and pioneering work as president of the original Players’ Association laid the groundwork for the current NHLPA. The “most outstanding player” Award was first introduced as the Lester B. Pearson Award following the 1970-71 National Hockey League (NHL) season. The Award was named after the 14th Prime Minister of Canada and Nobel Peace Prize winner. The Lester B. Pearson Award was presented to 22 different players over 38 seasons. Some of the most decorated names in hockey history have been voted “most outstanding player,” including Phil Esposito, Bobby Orr, Guy Lafleur and Alex Ovechkin. Wayne Gretzky was the most decorated Award recipient during the Pearson era, taking home the honour on five occasions, including four consecutive years. Mario Lemieux captured the Award four times but never in back-to-back seasons. In 1993-94, Sergei Fedorov became the first non-Canadian born player to receive the Award, opening the door for other European players to receive the coveted prize, representing the international flavor of modern hockey. 2008-09 marked the final presentation of the Lester B. Pearson Award, as the Players would choose to honour one of the legends of the game and the Association by re-naming the award after Ted Lindsay. While the name has changed, the history of the Award and its significance for NHLPA members remains as strong as ever. The inaugural recipient of the Ted Lindsay Award was Washington Capitals forward Alexander Ovechkin in 2009-10. After receiving the final two Awards of the Lester B. Pearson Award era, the Russian superstar became the first player since Wayne Gretzky in the 1980s to be named “Most Outstanding Player” in three consecutive seasons. 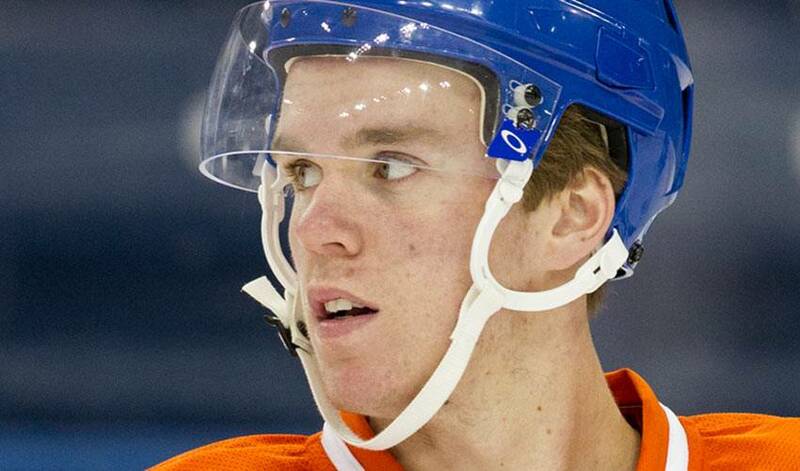 McDavid, of Richmond Hill, Ont., Canada, played in all 82 regular-season games for the Edmonton Oilers, for the second straight season. The Oilers’ captain led the league in points (108) to win his second consecutive Art Ross Trophy, while recording the third-most assists (67), scoring the sixth-most goals (41) and placing first in points per game (1.32). McDavid led the NHL in multi-point games (32), as well as even-strength goals (35), assists (49) and points (84) – finishing with 18 points more than the second-ranked player in the category. Among league forwards, he also finished fourth in average ice-time per game (21:33). Last season, the 21-year-old became the third Oilers player (Wayne Gretzky, Mark Messier) to be named the most outstanding player by his peers. This year, McDavid becomes the first player in the history of the TLA to receive the players’ award twice before the age of 22.